The Amabubesi Finisher Club celebrates all riders who have finished three or more Absa Cape Epics. That pride of lions grows year on year, but at their head are four unique riders. They are the ever-present, fantastic four – the Last Lions – Craig Beech, John Gale, Mike Nixon and Hannele Steyn. 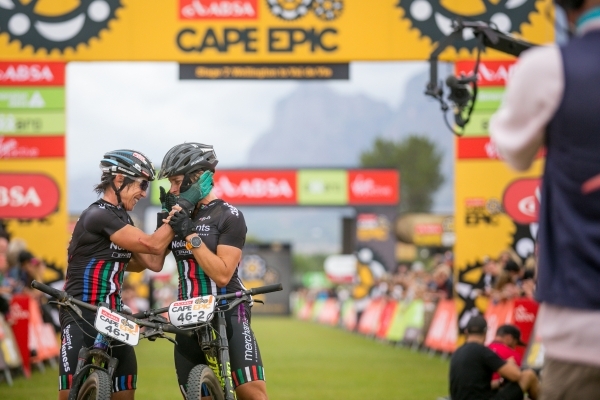 Since 2015, when Hendrik van Huyssteen last rode the Absa Cape Epic, the tussle for the Last Lion Trophy has been locked in a four-way battle, which shows no sign of abating. “I will try and do it until something outside of my power stops me” the rose among the thorns, Steyn, confided. That view is echoed by Beech, Gale and Nixon. “I have the tiger by the tail” laughed Gale, employing a fitting metaphor for the Untamed African Mountain Bike Race. Nixon’s response to when he will stop competing is equally entertaining: “After so many years, my wonderful wife has got used to the solitude from December to March. So when she wants me back I will stop.” Their responses beg the question: what makes four people dedicate so much time to a single event? “It has now become a little bit of a habit” Beech confessed. Her dedication to the Absa Cape Epic was honoured in 2018 with the creation of the Absa African Women’s Category. In seeking to promote women’s mountain biking on the continent, the race and title sponsors Absa invested in local cycling by honouring the best placed all-African women’s teams with red jerseys and at the end of the race with the Hannele Steyn Trophy. The trophy was designed by Kgaogelo Mashilo and features the Wawa Aba Adinkra symbol and the seeds from the West African wawa tree. Both the seed and the symbol are regarded by people of the Akan culture, for strength and toughness they are said to inspire perseverance through hardship. The first names on the Hannele Steyn Trophy are Candice Lill and Amy McDougall. As yet though there are no names on Dylan Lewis’s Last Lion Trophy. It is a work of rare beauty and features a lion lying on a rock surveying the plains of Africa stretching out before it. For the foreseeable future it will remain unadorned by a plaque as it can only be awarded to one rider. That four have endured so long is a remarkable feat. “It takes a whole year of luck in training and being lucky enough with health, work and personal life to be at the start line” Gale stated. Luck in getting to the star is only the beginning however. “Eight consecutive days of luck on the bike, not picking up an injury, not dehydrating, not getting sunstroke, not breaking the bike; it needs a lot of luck. Each year the field is stronger, faster, better equipped and better prepared” Gale said, undaunted by the challenge ahead. The pressure does not get to the Last Lions however. “It is the Tour de France of mountain biking, on your doorstep. How can you resist?” Nixon asked. He, Gale, Beech and Steyn show no signs of resisting any time soon. Their Amabubesi (a pride of lions) will not be shrinking in number.